* Baker, Kidd; McCarron, Earl. Wheeling back to Wheeling West Virginia. Toronto: Gordon V. Thompson, 1952. 2 p. Recorded on Gavotte by Kidd Baker and the Pine Ridge Mountain Boys; on Quality by Doc Williams and the Border Riders. * Ball, Ernest R. West of the Great Divide. Lyric by George Whiting. New York: M. Witmark and Sons, 1924. 5 p. Theme song and melody from Metro Goldwyn's motion picture version of the stage play "The Great Divide," featuring Alice Terry and Conway Tearle. * Barcelata, Lorenzo. The bells of San Raquel. English lyrics by Fred Wise and Milton Leeds. New York: Peer International, 1941, c1934. 5 p. Cover: Featured by Tony Pastor. v.1, no.11, Nov. 1945. 14 p.
Beeson, Jack. 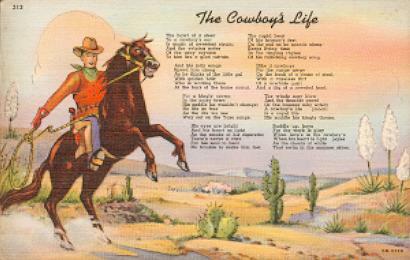 Cowboy song: for baritone voice and piano. Lyrics by Charles Causley. New York: Galaxy Music, 1989. Ben Bernie (the Ole Maestro) collection of favorite songs. Chicago: Chart Music Publishing House, 1946. 44 songs. * Berlin, Irving. "I've got the sun in the morning." New York: Irving Berlin Music Company, 1946. 5 p. Rogers and Hammerstein present Ethel Merman in Annie get your gun. * Berlin, Irving. "I've got the sun in the morning." New York: Irving Berlin Music Company; Toronto: Gordon V. Thompson, 1946. 5 p. Rogers and Hammerstein present Ethel Merman in Annie Get Your Gun. * Berlin, Irving. "The girl that I marry." New York: Irving Berlin Music Company, 1946. 5 p. Betty Hutton in Annie get your gun (movie), directed by George Sidney. * Best-loved hillybilly and cowboy songs: with words and music. New York: Movie Songs Inc, 1946. 26 p. 12 songs. * The best of the West song folio. New York: Bregman, Vocco, and Conn, 1944. 32 p.
* Best songs. Derby, CT: Charlton Publishing, c1940-61 monthly. v.7, no.10, Oct. 1947. 16 p.
v.9, no.4, May 1949. 15 p.
v.10, n.12, Dec. 1950. 16 p.
v.11, n.4, Apr. 1951. 16 p.
v.11, n.11, Nov. 1951. 16 p.
v.14, n.4, Apr. 1954. 16 p.
v.14, n.5, May 1954. 16 p.
v.14, n.6, Jun. 1954. 16 p.
v.14, n.7, Jul. 1954. 16 p.
v.14, n.8, Aug. 1954. 16 p.
v.14, n.9, Sep. 1954. 16 p.
v.14, n.10, Oct. 1954. 16 p.
v.14, n.11, Nov. 1954. 16 p.
v.14, n.12, Dec. 1954. 16 p.
v.15, n.1, Jan. 1955. 16 p.
v.15, n.2, Feb. 1955. 16 p.
v.15, n.3, Mar. 1955. 16 p.
v.15, n.4, Apr. 1955. 16 p.
v.15, n.5, May 1955. 16 p.
v.15, n.6, Jun. 1955. 16 p.
v.15, n.7, Jul. 1955. 16 p.
v.15, n.8, Aug. 1955. 16 p.
v.15, n.10, Oct. 1955. 16 p.
v.15, n.11, Nov. 1955. 16 p.
v.15, n.12, Dec. 1955. 16 p.
v.16, n.1, Feb. 1956. 16 p.
v.16, n.2, Mar. 1956. 16 p.
v.16, n.3, Apr. 1956. 16 p.
v.16, n.4, May 1956. 16 p.
v.16, n.5, Jun. 1956 16 p.
v.16, n.6, Jul. 1956. 16 p.
v.16, n.7, Aug. 1956. 16 p.
v.16, n.8, Sep. 1956. 16 p.
v.16, n.10, Nov. 1956. 16 p.
v.16, n.11, Dec. 1956. 16 p.
v.17, n.1, Jan. 1957. 16 p.
v.17, n.2, Feb. 1957. 16 p.
v.17, n.3, Mar. 1957. 16 p.
v.17, n.4, Apr. 1957. 16 p.
v.17, n.5, May 1957 16 p.
v.17, n.6, Jun. 1957. 16 p.
v.17, n.7, Jul. 1957. 16 p.
v.17, n.8, Oct. 1957. 16 p.
v.17, n.9, Dec. 1957. 16 p.
v.20, n.1, Jun. 1961. 16 p.
* Big Rock Candy Mountain. Chicago: Calumet Music, 1935. [3pp] Cover: Featured by Smiley Burnett. * The big round up of cowboy songs. Toronto: Canadian Music Sales Corporation Ltd., 1934. 57 songs. 96 p.
Big Slim -- the lone cowboy -- favorite songs. ? : H.C. McAulife, nd. * Big song magazine. New York: Charlton Publishing, c1941- ?. monthly. v.2, no.3, March 1942. 32 p.
v.2, no.5, May 1942. 32 p. See: "Beautiful Texas Moon," "Down by the Rio," "In cowboy land," "Riding done that old Texas trail," "The cowboy," "The long, long trail is ending." v.2, no.6, June 1942. 32 p.
v.2, no.11, November 1942. 32 p.
v.4, no.6, Jul. 1944. 16 p. See: "San Fernando Valley." 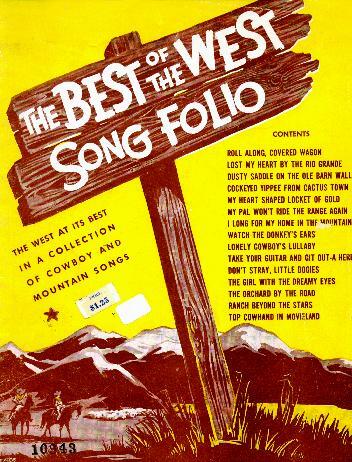 * Bill Boyd and his Cowboy Ramblers' folio of western songs. No.1. Portland, OR: American Music Inc., 1939. 48 p.
On cover: Containing 20 original songs. 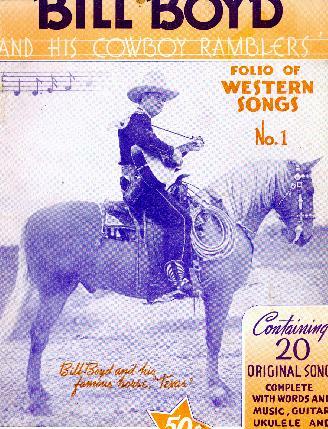 * Bill Boyd deluxe song book: cowboy songs, home songs, western songs, mountain songs. Chicago: M. M. Cole Publishing, 1944. 96 p. Ill. 86 songs. * Bill Boyd's edition of the Cowboy sings: songs of the ranch and range: traditional songs of the western frontier arranged for general singing. Edited by Kenneth S. Clark. New York: Paull-Pioneer Music, 1932. 96 p. Ill. Includes glossary. 79 songs. Bill Monroe's blue grass country songs. New York: Hill and Range Songs Inc., c1953. * Bill Nettles homespun songs of the hills. Chicago: Chart Music Publishing, 1945. 50 p.
26 songs. See: "How I love my mountain home", "Little old sod shanty". Billy Binns' (the Cowboy Blue Yodeler) ranch, range and home songs: containing 30 well known songs. No.1. New York: Stasny Music, c1937. 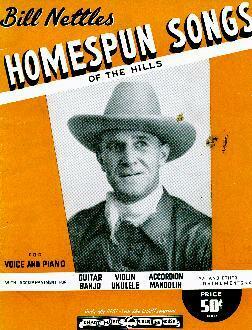 Billy Hill's American home songs. New York: Shapiro, Bernstein and Co., c1934. * Bing Crosby dance folio. No.2. New York: Famous Music Corporation, 1936. 48 p. Includes photos from movies "She loves me not," "Here is my heart," "The big broadcast of 1936," "Mississippi," "Rhythm on the range." Lyrics handwritten to most of 11 songs. Cover: title "Famous Music Corporation's Bing Crosby dance folio." * Bing Crosby's popular song folio. New York: Edwin H. Morris and Company, 1944. 32 p. 14 songs. See: "San Fernando Valley." * Bing Crosby's western song folio. New York: Edwin H. Morris and Company, 1945. 32 p. 14 songs. See: "Somewhere in Old Wyoming." Bingham, Seth. Five cowboy songs. New York: H.W. Gray Co., 1930.